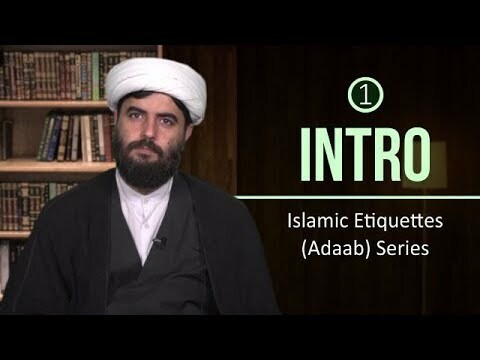 This session: - Introduction - Etiquettes and respect - Definition of Etiquettes - Meaning of Etiquettes - Etiquettes in the eyes of Imam Ali (A) Hujjatul Islam Haq Panah is a Howza teacher in Qom, Iran. This session: - Do countries and nations have etiquettes? - Can personal preferences determine etiquettes? - What\'s the ideal source of etiquettes? - Why is the ideal source ideal? - Do we need a role model? Hujjatul Islam Haq Panah is a Howza teacher in Qom, Iran. 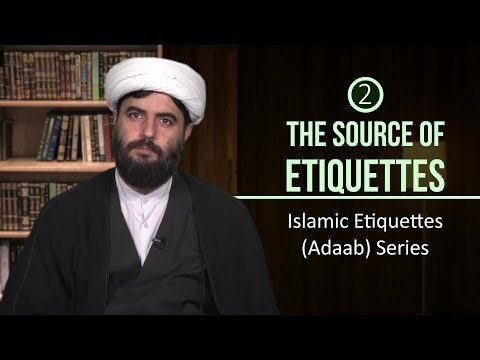 Walking Etiquettes | Islamic Etiquettes (Adaab) Series This session: - Walking etiquettes - Walking arrogantly - Walking boastfully - Balance & equilibrium in walking - Walking slow or fast - Looking around while walking Hujjatul Islam Haq Panah is a Howza teacher in Qom, Iran. Etiquettes of Wearing Clothes 3 | Islamic Etiquettes (Adaab) Series This session: - Wearing black clothes is Makruh - Exception 1: Hijab - Exception 2: Mourning - Lawful material of clothes - Lawful purchase of clothes Hujjatul Islam Haq Panah is a Howza teacher in Qom, Iran. Etiquettes of Wearing Clothes 4 | Islamic Etiquettes (Adaab) Series This session: - Wearing see-through clothing - Attracting attention - Prophet\\\'s Sunnah - Hijab is a source of attraction - Difference between Mo\\\'min and Disbeliever Hujjatul Islam Haq Panah is a Howza teacher in Qom, Iran. Etiquettes of Masjid 3 | Islamic Etiquettes (Adaab) Series This session: - Etiquettes of Masjid - Dhikr (Remembrance of Allah) - Outer beauty & Inner beauty - Wearing clean clothes & perfume - Making Masjid najis is haram - Entering of Kuffar in Masjid Hujjatul Islam Haq Panah is a Howza teacher in Qom, Iran. 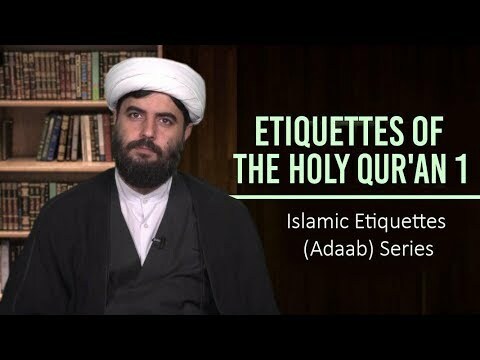 Etiquettes of the holy Qur'an 1 | Islamic Etiquettes (Adaab) Series This session: - Etiquettes of Reciting the Holy Quran - Being in the Wudhu & Purity - Seeking Protection of Allah - Recitation at slow paced manner - Contemplation and Reflection Hujjatul Islam Haq Panah is a Howza teacher in Qom, Iran. 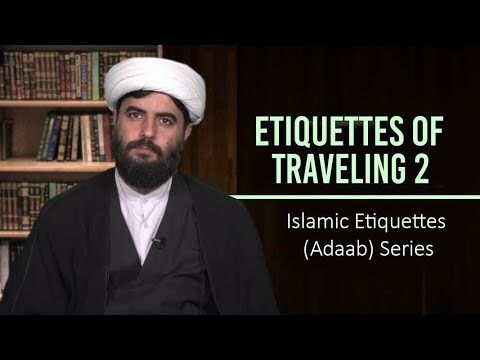 Etiquettes of Traveling 1 | Islamic Etiquettes (Adaab) Series This session: - Etiquettes of Traveling - Intention before Traveling - Traveling for Physical Tiredness - Where to go for traveling? - Quranic Verse regarding Traveling Hujjatul Islam Haq Panah is a Howza teacher in Qom, Iran. Sleeping Etiquettes 5 | Islamic Etiquettes (Adaab) Series This session: - The Actions of Fatima al-Zahra (S) - Four Actions Taught by Prophet - Finish one Quran before sleeping - Make the messengers your intercessor - Make all believers happy before sleeping - Do a Hajj and Umrah before sleeping Hujjatul Islam Haq Panah is a Howza teacher in Qom, Iran. Sleeping Etiquettes 7 | Islamic Etiquettes (Adaab) Series This session: - Sleeping too much - Effects of over-sleeping - What is appropriate sleep? - Ill-advised times for sleep - Sleeping in the state of Janabat - Ghusl or Tayammum? Hujjatul Islam Haq Panah is a Howza teacher in Qom, Iran. Etiquettes of Wearing Clothes 2 | Islamic Etiquettes (Adaab) Series This session: - Wearing colorful and cheerful clothes - Wearing black is Makruh - Three exception in wearing black - Is it bad for women to wear black? - Is it bad for men to wear black? Hujjatul Islam Haq Panah is a Howza teacher in Qom, Iran. This session: - Etiquettes of leaving home - Zikr (Remember Allah) - Giving Sadaqah (Charity) - Confirmation of Ulama - Hadith of Holy Prophet (S) Hujjatul Islam Haq Panah is a Howza teacher in Qom, Iran. 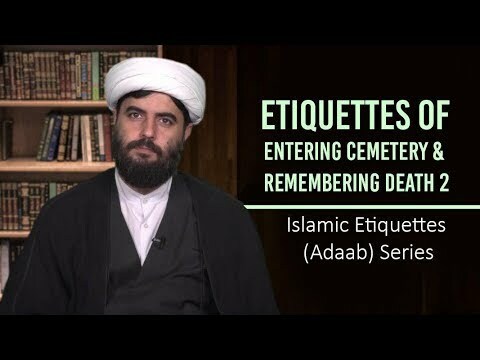 Etiquettes of Entering Cemetery & Remembering Death 1 | Islamic Etiquettes (Adaab) Series This session: - Remembrance of Death - Why are there sins in the society? - An Iota of Good and Bad - The most intelligent and clever - Why remember death a lot? - What is a barrier for carnal desires? Hujjatul Islam Haq Panah is a Howza teacher in Qom, Iran. Etiquettes of Entering Cemetery & Remembering Death 2 | Islamic Etiquettes (Adaab) Series This session: - Consequences of not remembering death - Three things for a dying person - Reality of Wealth - Reality of Children - Reality of Actions - The benefit of remembrance of death Hujjatul Islam Haq Panah is a Howza teacher in Qom, Iran. Etiquettes of Entering Cemetery & Remembering Death 3 | Islamic Etiquettes (Adaab) Series This session: - Entering cemetery with Wudhu - Salutations upon the buried ones - Reciting Dua when entering the cemetery - Don\'t put feet upon the graves - Don\'t talk about worldly matters - Effective contemplation in cemetery Hujjatul Islam Haq Panah is a Howza teacher in Qom, Iran. Etiquettes of Entering Cemetery & Remembering Death 4 | Islamic Etiquettes (Adaab) Series This session: - Refrain from laughing - Reciting Surah Fateha, Ikhlas, Qadr - Sadaqa & charity on behalf of our deceased - Where can charity be spent? - Refrain from sitting on the graves - Do not read namaz between the graves Hujjatul Islam Haq Panah is a Howza teacher in Qom, Iran. Etiquettes of Masjid 2 | Islamic Etiquettes (Adaab) Series This session: - Finding good friends - Acquisition of knowledge - Strength in belief - Learning Ahkam rulings - Mercy of Allah - Change of course of life - Adherence to Islamic rulings - Fear & Peer Pressure Hujjatul Islam Haq Panah is a Howza teacher in Qom, Iran. Etiquettes of Masjid 4 | Islamic Etiquettes (Adaab) Series This session: - Entering & Exiting the Masjid - Sleeping in the Masjid - Cleanliness of the Masjid - Namaz of Tahiyat - Applying Purfume - Neighbors of Masjid Hujjatul Islam Haq Panah is a Howza teacher in Qom, Iran. Etiquettes of Masjid 5 | Islamic Etiquettes (Adaab) Series This session: - Frequently attending the masjid - Worldly talk in the masjid - Religious talk in the masjid - Political talk in the masjid - Sitting in the masjid awainting namaaz - What nullifies the worship? Hujjatul Islam Haq Panah is a Howza teacher in Qom, Iran. Etiquettes of Masjid 6 | Islamic Etiquettes (Adaab) Series This session: - 3 groups earn reward for being in the masjid - Cleaning the masjid - Doing business in the masjid - Bringing insane people to the masjid - Announcements in the masjid - Speaking loudly in the masjid - Implementing divine punishments Hujjatul Islam Haq Panah is a Howza teacher in Qom, Iran. Etiquettes of the holy Qur'an 2 | Islamic Etiquettes (Adaab) Series This session: - Applying Tooth Brush - Accent, Tajwid, Tone, Voice - Receiving Praise or Income VS Guidance - How many verses should I recite daily? - A Tip for Enhanced Spirituality Hujjatul Islam Haq Panah is a Howza teacher in Qom, Iran.